My little man has been asking for crafts this Summer, we have been doing a lot of playing outside, but I felt like I was lacking in the craft department, so last week we crafted a little bit. I apologize for the phone pictures, but the phone was handy. 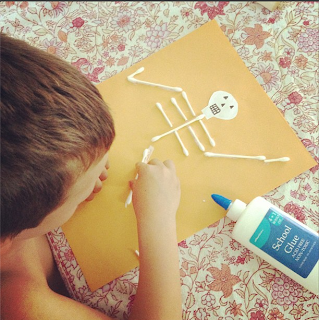 Here is one of the crafts we had this week: a Q-tip skeleton! I cut up the and drew the face and the Q-tips for him, but he did all the glueing and then asked me for some yarn to make hair. Isn't it cute? He had so much fun that he asked to make another, without the hair, so he had a boy and girl. Oh I love my little guy!